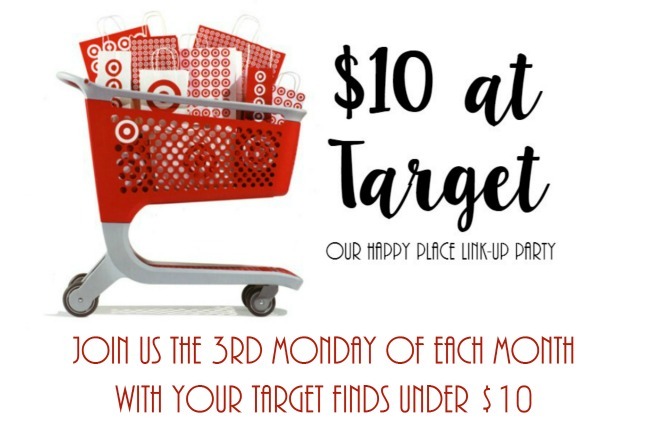 I am so excited to be co-hosting my first $10 at Target link up. You all know how much I love Target and I know how much you all love Target. It just runs in our mommy blood. I go into Target with a set list every time and I always end up buying way more. Either I hit up the dollar spot and buy all the things or I hit up the shoes and decide I need a pair or three. I just can't help it. Oh and don't get me started on the Cat and Jack line for my girls. I love their clothes and shoes and want to buy it all everytime I am there. Just too cute. But anyways, I was at Target a couple weeks ago and I was browsing around the framing area to hang a large coffee bag that we got on our honeymoon in Hawaii (yes it has been almost 4 years of having it and not hanging it), and I found a new summery candle that I had to have my hands on, Watermelon Twist. It smells like 4th of July because we always have a huge plateful of watermelon. Plus it was on sale from $10 to $7.50. From the home decor area, I went towards the candy aisle because I was searching for the large Andies Mints for my husband. He loves them so much and has got my daughters hooked on them. So bad. After I found the large Andies, I saw my favorite Airhead Bites in the family size and scooped those up. I got them for $2. Those babies came with me on my work trip to Las Vegas at the beginning of the month. Now it is your turn to share with us how you spent your $10 at Target. How fun!! You did good on your buys, I bet that candle smells amazing! That watermelon candle I bet smells just like summer!! So fun seeing how everyone is spending their $10! It really does smell like summer. I love seeing how everyone spent theirs as well! Just love their candles!! How fun! Great finds! The candy looks yummy! Target really has the best candles. I am at the bottom of one I got from there & that thing smelled so good the entire time it burned! Nice, the watermelon candle sounds like it would smell great! I LOVE watermelon! It is my favorite flavor of Airheads, Jolly Ranchers, and Blow-Pop and pretty much any other candy that has that flavor! I will definitely be snagging one of those the next time I'm there! I also love those Airhead bites! Beth at OPLG got me hooked on those! They are so freaking good. Airheads were always a favorite growing up! I love good smelling candles, you did good with that find! Most of the time I'm with the kids when doing this and have to rush and unfortunately can't look everywhere, darn! Such a fun post! That watermelon candle looks like it smells so good! I've been looking for a great summer candle! All of mine are autumn/winter smells and I need something fresh for summer. Watermelon sounds perfect! That is what I had, so I scooped this one up right away! This is such a fun post/linkup idea! I can only imagine how good that candle smells & I love airheads-- but I've never seen them in bite size before! Such a fun link Up!!! That candle sounds awesome. Aw fun! I love a good candle! I went to Target this weekend and somehow walked out under $50, I was so proud of myself! Oooo that candy sounds yummy. Ha ha, can I say that about a candle? I need to get some of those AirHeads for Cam. He loves them, but that size would be better so he doesn't eat too much. I need to remember this link up! I've never tried any of their candles before. I definitely need to get some summer-y scents/decor around here! Watermelon candle?! Sounds divine! I need to try one! Yes you do. They smell amazing! I love watermelon candles! I will have to look for that next time I go and give it a sniff. This is such a fun link-up!! I need to join in next time - I just bought the cutest little string lights and drink holders in the dollar spot last week. Now I need to be on the lookout for those candles - we have so many "winter" scents with cinnamon and other spices, I need some warm, fruity scents for summer!